Nova loves to use large cones of thread, but carrying the heavy iron based stand that sits behind the machine is tiresome when headed to a sewing bee or just traveling with a Featherweight. This great new thread stand works wonderfully, feeding thread off of large cones smoothly. Notice in the second photo how it fits nicely in the tray of Nova's Featherweight, or in the third photo how it fits easily into a case with a cleat for the foot controller. It does not attach with screws or anything to mar the finish on your Featherweight, but drops down into an oil hole. Nova travels with the machine pictured and has tested this new product herself. So much lighter and easier to carry! 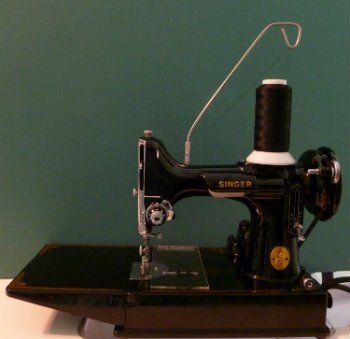 FEATHERWEIGHT MACHINE, NOVA'S SEW STRAIGHT GUIDE, FOOT CONTROLLER, THREAD, ETC. ARE NOT INCLUDED IN THE PRICE - ONLY THE THREAD STAND. DOES NOT FIT ON SOME AE and AF SERIES FEATHERWEIGHTS. The oil hole on some AE and AF series machines is slightly larger. This problem is easily solved by wrapping the end of the thread stand with a bit of tape. NOTE! The product developer has changed the design a bit for smoother thread delivery. There is no longer an eyelet. You thread directly through the hole in the thread stand.